What is a Dram? How Much is a Dram? You’ll most often hear people talk about how they’re going to enjoy a dram of Scotch or pour themselves a wee dram, which is a unit of measure not often used in the United States. It usually refers to a “small amount” but it actually has a definition according to the U.S. Customary System. A US fluid dram is an eighth of a fluid ounce, 60 min (that’s short for minim, which is about a drop) or around 3.7 mL of liquid. How much is a dram of Scotch? 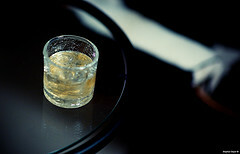 If you do any reading about Scotch, or whiskey in general, you’ll often read people talk about having a dram of Scotch. Intuitively we know it’s some measurement, that we pour a bit of the golden (or amber or whatever, depending what you prefer!) elixir, call it a dram, and go about our merry way enjoying it. But, what exactly is a dram? Historically, a dram was a coin, a unit of mass, and a unit of volume. For volume, it’s an eighth (1⁄8) of a fluid ounce. For all practical purposes, a dram just means “a wee bit” when you talk about Scotch. No one is holding a measuring spoon when they measure out their drams! Need a vessel to hold that dram? Here are our selections for the best glass for Scotch.